I was not inured to the siren call of books myself. I wandered, transfixed by the endless shelves and scroll niches, the colonnaded courtyards and burbling fountains, the scholars passionately scribbling treatises at long wooden tables, the gentle slant of sunlight along the open corridors. A fire-breathing, heartwarming, mind-wrecking journey. There are dragons, and half-dragons, and mind-gardens and mind-fire. There are Saints and monsters and Knights and quigutl. But you might already know of this wonderful world, if you’ve already read Seraphina. Shadow Scaleis its sequel. I adored Seraphina. And yes it took me a little time to settle into this world again, to build it up in my mind and wallow in it, getting myself comfortable, cocooning myself. Never an easy thing to do but Hartman does a pretty decent job at it. While Seraphina is the main character in both books, it is her relationship with the other characters, humans, dragons, half-dragons, and even that little family she maintains in her mind garden that make the series wonderful. So I wrote those paragraphs above a few months ago while the book was still fresh in my mind. 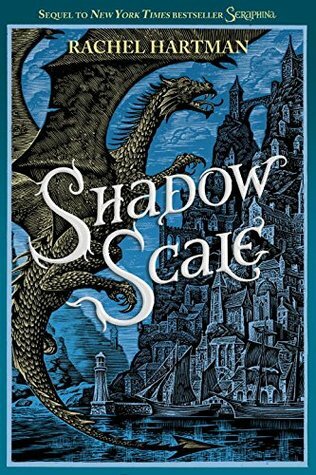 Today though, while I do think the two books still make for an excellent read together, Shadow Scale pales a little with regards to Seraphina. But that tends to be the case with second books, doesn’t it? The first stuns and astonishes with its world-building and the reader’s discovery of new characters and the plot, so much that sometimes the sequel seems an afterthought. Luckily Shadow Scale is not a mere afterthought. It was just as welcoming to dive back into and to revisit old friends, but also to explore new places and meet new people with Seraphina. Plus how can I resist a book that ventures into a library, if only for a little bit. I was really excited to see this book on the Baileys Women’s Prize for Fiction longlist. Wong’s book is largely set in England but also features Singapore, as the late mother of her main character Xing Li, is from Singapore – Wong’s parents were also from Singapore and moved to England where Wong was born. Their Auntie Mei is an actress, and it isn’t easy being an Asian actress in England, or anywhere for that matter.. I start to daydream about what is would be like to grow up in a country where I am not seen as different. Somewhere where I am popular and don’t have to explain my name or that I’m Chinese. It would be a really cool place where Asians and Jamaicans are just seen as doctors, school girls and business women. Not “the Chinese doctor”, “the Asian school girl” or “the black businesswomen of the year”. It would be a country where I was not seen as “ethnic” or “exotic” but just “me”. That would be great! The Life of a Banana makes me reflect on my own situation. I grew up in Singapore and about six years ago moved to the US. The husband is also from Singapore but my children were born in the US. Singapore is about 3/4 Chinese, so there we were among the ethnic majority. So I (unfortunately) never gave much thought about that when I was growing up. But having read this book about growing up British Chinese (fiction, yes, but I reckon it reflects Wong’s own experiences), I’ve been wondering what it will be like for my children to grow up here. It’s always been in the back of my mind (and my husband’s), whether we should stay here or return to Singapore, where the rest of our families are. There are many reasons to go, many reasons to stay. Neither answer really seems right for now. On a similar note, I shall be posting later this week about Bone, another book written by a Chinese writer, one who grew up in San Francisco. That’s a very different book, but I can’t help but think of it as I write this post. 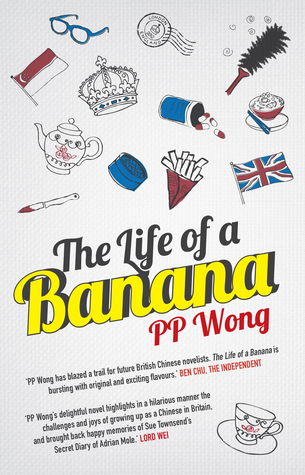 PP Wong is the first British Born Chinese novelist to get a publishing deal in the UK. After completing a degree in Anthropology and Law at the London School of Economics, she did a Postgraduate Diploma in Journalism. Her debut novel The Life of a Banana is about race relations in London seen through the eyes of a 12-year-old girl. It was longlisted for the Baileys Women’s Prize for Fiction 2015 (formerly Orange Prize for Fiction). The rights have already been sold for eight countries including Italy, Israel, Thailand, Singapore, Malaysia and Indonesia. PP Wong is now an author, freelance writer and the Editor-in-Chief of website http://www.bananawriters.com The website has readers from over twenty countries and is a voice for East Asian and South East Asian writers.